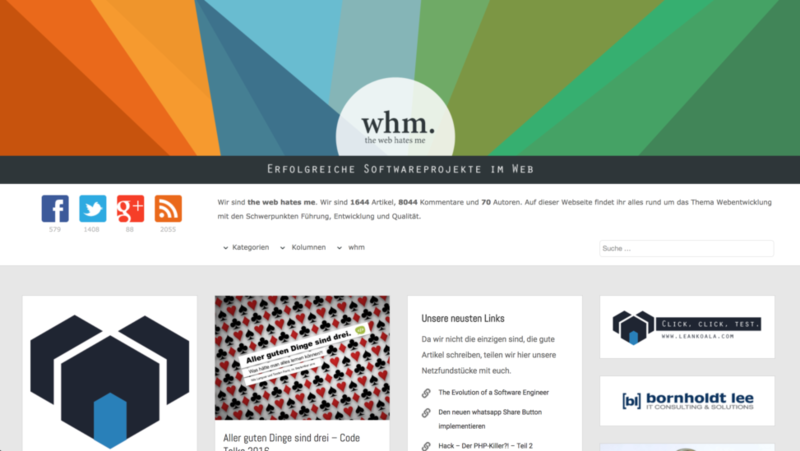 The web hates me started as phphatesme in 2008 and is one of the best known German php blogs. Phphatesme started in 2008 as a hobby project, but grew to be the most famous German php blog the next year. With about 2.000 readers a day in 2010 it became an important source of information for the german php community. In 2013 the blog was renamed to “the web hates me” and is still one of the most important contact point for many web devlopers. The web hates me platform in build on the shoulders of wordpress and is almost feature complete. Small features are release now and then but most of the changes that are made are editorial. The goal was to continuously check the website after new articles ort features. The web hates me is based on wordpress. That means, that the main feature like creating a blog post or a page should work by default. The templates for the homepage, the posts and the pages where created from the scratch as well as some wordpress plugins. testing purposes we created a special test post. rendering is already tested within the home page.